AISTech 2016 takes place May 16 - 19 at the David L. Lawrence Convention Center in Pittsburgh, Pennsylvania. 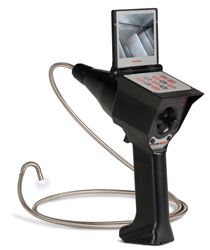 RF System Lab’s Borescope Expert, Jess Kuznicki, will be onsite, among over 500 exhibitors, presenting the VJ-Advance video borescope at booth #3248. AISTech 2016 takes place May 16 - 19 at the David L. Lawrence Convention Center in Pittsburgh, Pennsylvania. AISTech is steel’s premiere technology event featuring technologies from all over the world that help steel producers compete more effectively in today’s global market. More than 8,000 attendees from any level of today’s steel marketplace, will fill the convention center to take advantage of the opportunity to network with industry peers and discover ways to improve their productivity. AISTech features over 550 technical presentations and the steel industry’s largest annual trade show and exhibition. The event begins on Sunday, May 15th with the AIST Foundation Golf Classic, followed by Plant Tours. Follow all of the happenings of AISTech 2016 on Twitter with #AISTech or by downloading the mobile app with event schedules, floor plan, notes section, and walking map of the convention center. More details can also be found on at http://www.AIST.org.